I had an informal chat with Guillermo a couple of weeks ago. I wrote up my notes (the non-confidential parts) because it was both interesting and inspiring to any of you who want to open a business in an area you're both passionate about and in which you believe there's a big opportunity. 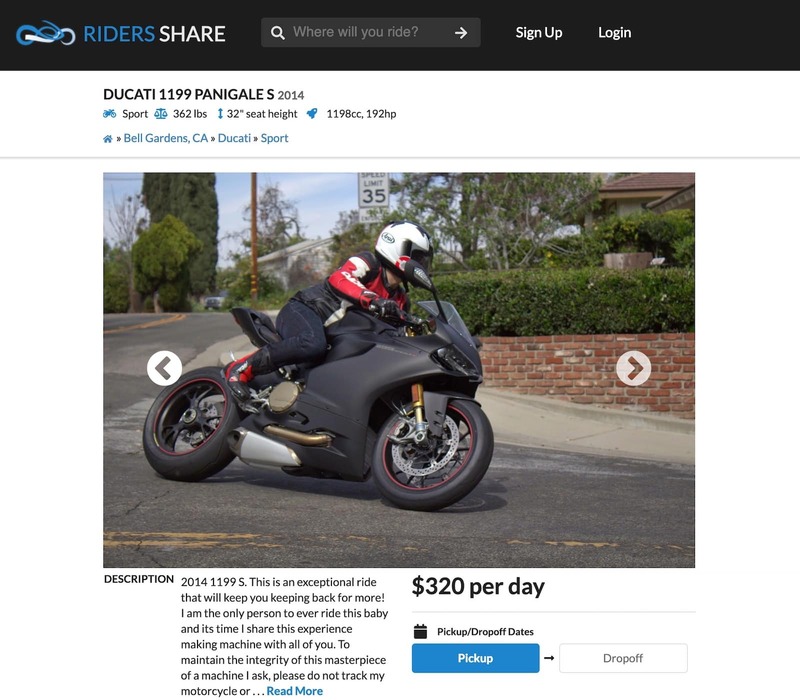 Riders Share is one of the latest marketplaces to spring up. This is focused on motorcycles. The only other major motorcycle marketplace is Twisted Road. Both Twisted Road and Riders Share have around 1,000 motorcycles (give or take) in their inventory. The idea is: if you have ever owned a motorcycle, you've probably a) owned more than one at once (some say "5" is the magic number) and b) lamented at how some or all of your motorcycles never get ridden. So you consider selling them. But is there an easier way? Yes: Rent them out to fellow riders, most of whom will take care of them. Guillermo founded the marketplace basically for this reason. "I have this sweet Ducati Monster" he thought. "But I'm not riding it enough. Why isn't there an easy way to rent it out?" In phase one of the Riders Share website, I admit I wasn't optimistic about its prospects. The website was functional, but the experience wasn't very modern. It was clunky, slow and the UI was not friendly. I nevertheless uploaded my motorcycles, but didn't get any pings. Then I got an email saying my photos had been accidentally deleted and needed to be uploaded. Then I got an email saying they were shutting down for 6 months or more as their insurance provider had pulled out. Admittedly, I thought this was the end of Riders Share. But not yet. Six months later, they refreshed, almost into an entirely different company. I was quite surprised when Riders Share announced they had a new insurance partner, early in 2018. I was even more surprised when I saw they relaunched their web page... and it looked a LOT slicker. Not knowing Guillermo at the time, I had given them up for dead when they lost their insurance partner. I asked him recently how he got through that period. "We took the opportunity to improve the website." Guillermo was aware it could do with a refresh, and he and his co-founder went away to do it, using their downtime to their advantage. And they didn't tell anyone about it — it was just a pleasant surprise. "We're not in the transport industry," Guillermo told me. "We're in the tourism industry." People don't rent motorcycles in the US because they need them. They rent them for fun. If you need to get around town in a city or go on a road trip, you're much more likely to rent a car, or maybe an RV. This is anecdotally true from the people who rented from me (I did around five transactions on Riders Share, and received many more enquiries). They all had some trip in mind and wanted to do it on motorcycle. People want a machine that will satisfy a desire for fun: a bagger Harley for a road trip, a fun Ducati, or a BMW with all the luggage and accessories. Motorcycles unlikely to go rented are: scooters, small motorcycles and anything boring. Nobody is going to rent your commuter Sym 150... unless they just need it to do a test! Seasonality is very strong, with people much more likely to look for a motorcycle during heavy travel seasons. There are two main sources out there. Option 1: Rent from Twisted Road. I have limited experience with them, but I didn't like the interface as much. That's all I can say! The experience is likely to be the same, overall. I don't know if they provide insurance or anything. Option 2: Rent from an established shop, like DubbelJu, . The advantage is they're more experienced at motorcycle rentals. The motorcycles are much more likely to be in rideable condition. Insurance is easier. Perhaps most importantly with renting from a shop, there are many times when you can pick up and drop off in different cities. When I had my motorcycle on Riders Share, I got this request about 1/3 times. It's a VERY popular criterion, and one people are willing to pay more for. There are many reasons people wouldn't and shouldn't rent their own motorcycle out. I listed them here on my full review of Riders Share as an owner. Basically, most people don't want to rent out their primary transportation, their primary fun vehicle or something they love. It's similar to letting someone into your home, except it's also far more intimate. There's a lot that can go wrong. I generally wouldn't recommend renting out a motorcycle unless you're experienced at maintenance and repairs. It will be harder to sell your motorcycle if people know you rent them out, which they will with very little googling. There can be many, small, troublesome issues that came up over time. For example, one renter bent my handlebars in an imperceptible way and another blew my fork seals. I didn't notice until it was time to sell the motorcycle. In general, there's definitely risk. But if you can find a more cost-effective and practical way to own five or more motorcycles than to rent them out, I'm all ears.